After you've finished creating your content, use the optimizer tool to improve your content's authority in search engines. Well-organized content with relevant links will give you the best chance of being found by your target market. Hover over an existing page or post in your dashboard and click Edit. Click the bar graph icon on the left pane. A sidebar pane will open with recommendations for you to optimize your content. Hover over the information icon info to see more details and suggestions. If you haven't attached this page to a topic in the SEO tool, you can attach it here as a pillar page or a piece of supporting content. 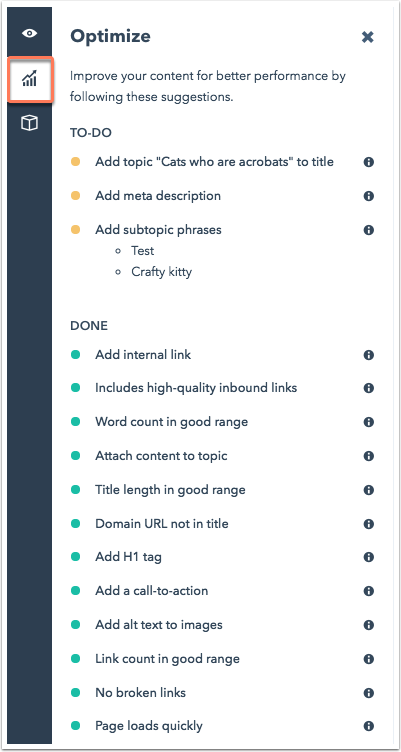 Linking subtopic keyword content back to your pillar page establishes authority for your topic in search engine results. Learn more about how the SEO tool can improve your content strategy. Click the Core Topic dropdown to select your core topic. If you don't have a topic related to this page yet, click SEO to create a new topic. Under the Content Type section, select whether this page should be attached as a pillar page or supporting content. If you select Supporting, use the Subtopic dropdown menu to attach this page to one of your subtopics. 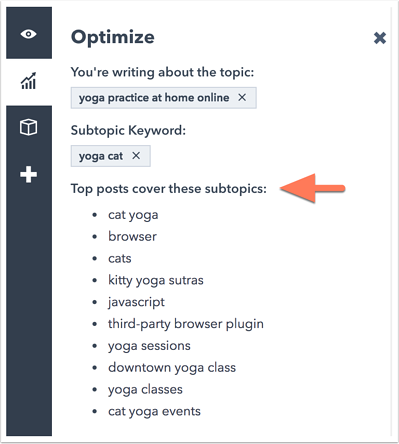 To create a new subtopic directly from the optimization sidebar, type your subtopic and hit the Enter key on your keyboard. After you've made your selections, click Attach to Topic. After you attach your page to a topic cluster, the optimization tab will update with more content suggestions to improve your SEO. The Top posts cover these subtopics suggestions list keyword phrases from the top search engine results for your subtopic keyword. Including related content in your page or blog post can improve SEO for your subtopic keywords. To edit your page or post's topic or subtopic keyword, click the X. Then you can create or select a different topic or subtopic for your content. Internal links: each page or blog post should contain a link to your pillar page or subtopic content. 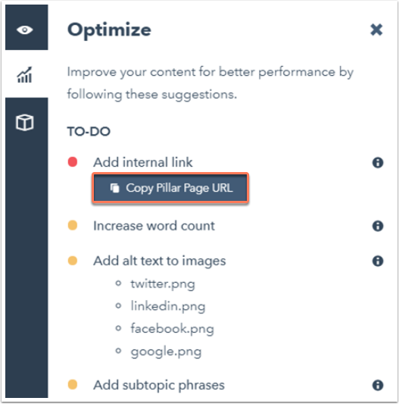 After content is attached to a pillar page, you can click Copy Pillar Page URL to copy a link directly from the optimize tab to easily insert a link into your content. Word count: each page or blog post should contain at least 330 words. To improve your site's ranking with search engines, your content should contain keyword phrases and original content. Call-to-action: it's recommended that your content contains a call-to-action (CTA). H1 tag: your page should contain at least one H1 tag to make it easier for search engines to find your content. Inbound links: search engines give more authority to pages with inbound links from authoritative and relevant external websites. Page title: the page title appears as the blue, bolded, underlined text on a Google search results page and across the tab of your web browser. Your page title should be less than 70 characters, and each page title on your website should be unique. Meta description: this description appears on a Google search results page directly under the page title. The copy should be 50 and 300 characters in length, and offer a clear, compelling reason to visit your page. Image alt text: adding alt text to your image makes your images accessible for visitors who use screen readers and helps improve your SEO. The alt text should match the file name, without dashes, e.g. Inbound Marketing Software. Page load time: the amount of time it takes the page crawler to load the HTML of your page.